With offices in Chillicothe, Columbus and Athens, Herlihy Mayflower is proud of the reputation our family-owned company has built throughout central and southern Ohio. We recently had the privilege of helping Kay W. move from Circleville, Ohio to Chillicothe, Ohio. Circleville is a city of about 14,000 that sits on the Scioto River. The county seat of Pickaway County, it is about 30 miles south of Columbus and 28 miles north of Chillicothe on Ohio Route 23. The city is famous as the host of the Circleville Pumpkin Show, an annual festival held since 1903. Home to Herlihy Moving & Storage since 1920, Chillicothe is the seat of and only city in Ross County. This historic southern Ohio city served as the state’s first and third capitals. Located along the Scioto River, the city has a population of about 22,000. To learn more, see our Guide to Planning a Move to Chillicothe, Ohio. Kay said her furniture and other belongings arrived in good shape and that her Chillicothe-based moving team was on time and efficient. “They were courteous and helpful!” she said. We appreciate your feedback, Kay, and hope you enjoy your new home in Chillicothe! Looking for a professional, reliable Chillicothe, Ohio moving company serving Circleville, Ohio? Contact us today to experience the Herlihy Moving & Storage difference. 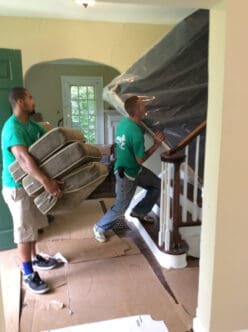 As one of Ohio’s oldest moving companies, we have moved thousands of families and businesses within Ohio, across the United States, and around the world. We’re BBB accredited and Angie’s List approved. And, as a locally owned and top-rated agent of Mayflower Moving serving Chillicothe, Athens, and Columbus, Ohio, we have the resources to move you, no matter where you need to go.